The new Subaru Forester quickly became the automaker's best-selling vehicle when it was launched late 2018. And that's not a surprise, because SUVs are big business for most car companies in 2019. Which is why I was keen to get my hands on the fifth-generation Forester or to Scooby fans, SK. Sean Parker spent a few days with the newcomer, now exclusively powered by a 2.0-litre Boxer engine, and found five reasons why the Forester is perhaps underrated compared to its rivals like the Toyota Rav4, Mazda CX-5 and the Nissan X-trail. 1. It has supreme ride quality - Under that boxy, bulgy exterior is a car with one of the smoothest ride qualities I have ever experienced. The new Forester is based on the firm's 'Global Platform'. The chassis has higher rigidity, is stronger and weighs less, which aids rolling resistance and helps provide better steering. The gearbox, a CVT, is a darn sight better than it was on the previous model. The engineers have even matched the engine noise and created a serene in-car driving experience. Top class. 2. It's one of the safest cars on sale - The Japanese firm announced that the new model achieved "the top rating in the Japan New Car Assessment Program (JNCAP) preventive safety performance assessment." As like other models in the company's line-up, the Forester is fitted with EyeSight, an umbrella of safety systems including braking if a pedestrian or another car is in a potential threat. The self-braking system worked overtime during the stint I tested the Forester, mainly due to pedestrians jaywalking. It's an effective halt that caught me by surprise on its first appearance. The Forester will also tell you if you've strayed out of your lane (via a message in the dashboard display) as well as if a car or cyclist is in your blind spot (via a yellow light on the side mirror). Other nifty safety features include a hold feature that maintains the vehicle on any gradient not only when you're on an incline. 3. The CVT isn't as bad you think - Continuously variable transmissions get a bad wrap from motoring hacks. Drawbacks include: a droning noise and the gears have same consistency to scrambling eggs. The reason? Well, there is an infinite number of gears which run on a belt. Subaru's in-house name for their CVT is Lineartronic. In the new Forester it weighs less than the unit in the previous model and is more efficient. Speaking of fuel efficiency I got pretty close to Subaru's claimed average fuel consumption figure of 7.6-litres/100km. Over five days I reduced it from over 10-litres/100km to 8.8-litres/100km. My point is, there are worse CVT's fitted to other cars in the market. In the Forester it works because it suits the lazy nature of the normally-aspirated engine. 4. Its non-turbocharged engine is a good thing (hear me out) - While some might lament the use of a non-turbocharged engine in the new Forester, my take is the 2.0-litre engine has some merits. It's an all-new Boxer engine featuring direct-injection producing 115kW and 196Nm. Those figures might seem paltry on paper but the Forester's engine does a fine job of hauling just over 1.6 tons. It is not the most enthusiastic engine and struggles at high revs, but if you modulate the throttle and drive it smoothly it can be rewarding. Another reason why I like the naturally-aspirated engine is because it's less complicated than a turbocharged unit. And I think Forester owners are likely to keep their cars for seven or eight years and the chances of something going wrong are less likely. Bear in mind the only other rival in the segment to use a naturally-aspirated four-cylinder engine is the upcoming Toyota Rav4, perhaps the Japanese are onto something here. 5. 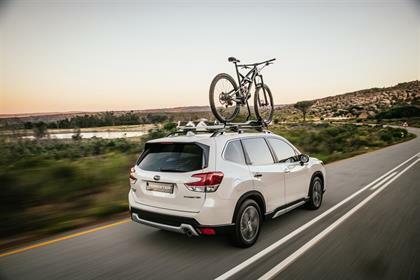 It comes standard with a lot of kit - Granted, we had the High Spec version on test, that retails for just shy of R500 000, but Subaru's stance is about packing its flagship model with enough kit to make your neighbours jealous. Standard features across the range are an easy to navigate high-res touchscreen infotainment with smartphone integration including Apple CarPlay and Android Auto. I linked up my iPhone via a USB cable and CarPlay worked easily and I really enjoyed working via the big touchscreen. There is, of course, the obligatory Bluetooth functionality available too. More standard equipment like electric windows, electric parking brake, electric side mirrors, multi-function display, keyless access and electrically-operated seats for the driver and passenger (our test unit had 2-memory programmable settings). Special mention must be made of the nine-speaker Harmon Kardon sound system and the tailgate can be opened and closed electronically.